Woodchips may be used as a biomass solid fuel and are raw material for producing wood pulp. They may also be used as an organic mulch in gardening, landscaping, restoration ecology, bioreactors for denitrification  and as a substrate for mushroom cultivation. The process of making woodchips is called wood chipping and is done using a wood chipper. The types of woodchips formed following chipping is dependent on the type of wood chipper used and the material from which they are made. Woodchip varieties include: forest chips (from forested areas), wood residue chips (from untreated wood residues, recycled wood and off-cuts), sawing residue chips (from sawmill residues), and short rotation forestry chips (from energy crops). Forestry operations provide the raw materials needed for woodchip production. Almost any tree can be converted into woodchips, however, the type and quality of the wood used to produce woodchips depends largely on the market. Softwood species, for instance, tend to be more versatile for use as woodchips than hardwood species because they are less dense and faster growing. A wood chipper is a machine used for cutting wood into smaller pieces (chips). There are several types of wood chippers, each having a different use depending on the type of processing the woodchips will undergo. Woodchips used for chemical pulp must be relatively uniform in size and free of bark. The optimum size varies with the wood species. It is important to avoid damage to the wood fibres as this is important for the pulp properties. For roundwood it is most common to use disk chippers. A typical size of the disk is 2.0 – 3.5 m in diameter, 10 – 25 cm in thickness and weight is up to 30 tons. The disk is fitted with 4 to 16 knives and driven with motors of ½ - 2 MW. Drum chippers are normally used for wood residuals from saw mills or other wood industry. There are four potential methods to move woodchips: pneumatic, conveyor belt, hopper with direct chute, and batch system (manual conveyance). A disk wood chipper features a flywheel made of steel and chopping blades with slotted disks. The blades slice through the wood as the material is fed through the chute. Knives located in the throat of the chipper cuts the wood in the opposite direction. The design is not as energy efficient as other styles but produces consistent shapes and sizes of woodchips. 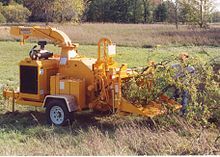 A drum wood chipper has a rotating parallel-sided drum attached to the engine with reinforced steel blades attached in a horizontal direction. Wood is drawn into the chute by gravity and the rotation of the drum where it is broken up by the steel blades. The drum type is noisy and creates large uneven chips but are more energy efficient than the disk type. A screw-type wood chipper contains a conical, screw-shaped blade. The blade rotation is set parallel to the opening so wood is pulled into the chipper by the spiral motion. Screw-type, also called high-torque rollers, are popular for residential use due to being quiet, easy to use and safer than disk and drum types. Woodchips are used primarily as a raw material for technical wood processing. In industry, processing of bark chips is often separated after peeling the logs due to different chemical properties. Only the heartwood and sapwood are useful for making pulp. Bark contains relatively few useful fibres and is removed and used as fuel to provide steam for use in the pulp mill. Most pulping processes require that the wood be chipped and screened to provide uniform sized chips. Woodchips are also used as landscape and garden mulch, producing benefits such as water conservation, weed control, reducing and preventing soil erosion, and for supporting germination of native seeds and acorns in habitat restoration projects. As the ramial chipped wood decomposes it improves the soil structure, permeability, bioactivity, and nutrient availability of the soil. Woodchips when used as a mulch are at least three inches thick. Woodchips can be reprocessed into an extremely effective playground surfacing material, or impact-attenuation surface. When used as playground surfacing (soft fall, cushion fall, or play chip, as it is sometimes known), woodchips can be very effective in lessening the impact of falls from playground equipment. When spread to depths of one foot (30 centimetres) playground woodchips can be effective at reducing impacts in falls up to 11 feet (3 meters). Playground woodchips are also an environmentally friendly alternative to rubber type playground surfaces. Woodchips can also be used to infuse flavor and enhance the smoky taste to barbecued meats and vegetables. Several different species of wood can be used depending on the type of flavor wanted. For a mild, sweet fruity flavor, apple wood can be used while hickory gives a smoky, bacon-like flavor. Other different types of wood used are cherry, hickory, mesquite and pecan. Woodchip piles at the edge of a field can inhibit nitrates from running off into water tiles. They are a simple measure for farmers to reduce nitrate pollution of the watershed without them having to change their land management practice. A 2011 study showed that most of the nitrate removal was due to heterotrophic denitrification. A 2013 experiment from Ireland showed that after 70 days of startup, a woodchip pile loaded with liquid pig manure at 5 L/m2/day removed an average of 90% of nitrate in the form of ammonium after one month. A January 2015 study from Ohio State University showed very low nitrous oxide gas, i.e. greenhouse gas emissions from nitrate transformation under the anaerobic conditions of the woodchip bioreactor. Scientists constructed a model for water flow and nitrate removal kinetics which can be used to design denitrification beds. It is unknown if other nutrients like phosphorus or pathogens are affected by the bioreactor as well. Woodchips have been traditionally used as solid fuel for space heating or in energy plants to generate electric power from renewable energy. The main source of forest chips in Europe and in most of the countries[which?] have been logging residues. It is expected that the shares of stumps and roundwood will increase in the future. As of 2013[update] in the EU, the estimates for biomass potential for energy, available under current 2018 conditions including sustainable use of the forest as well as providing wood to the traditional forest sectors, are: 277 million m3, for above ground biomass and 585 million m3 for total biomass. The size of the woodchips is particularly important when burning woodchip in small plants. Unfortunately there are not many standards to decide the fractions of woodchip. One standard is the GF60 which is commonly used in smaller plants, including small industries, villas, and apartment buildings. "GF60" is known as "Fine, dry, small chips". The requirements for GF60 are that the moisture is between 10–30% and the fractions of the woodchips are distributed as follows: 0–3.5mm: <8%, 3.5–30mm: <7%, 30–60 mm: 80–100%, 60–100 mm: <3%, 100–120 mm: <2%. The energy content in one cubic metre is normally higher than in one cubic metre wood logs, but can vary greatly depending on moisture. The moisture is decided by the handling of the raw material. If the trees are taken down in the winter and left to dry for the summer (with teas in the bark and covered so rain can't reach to them), and is then chipped in the fall, the woodchips' moisture content will be approximately 20–25%. The energy content, then, is approximately 3.5–4.5kWh/kg (~150–250 kg/cubic metre). Coal power plants have been converted to run on woodchips, which is fairly straightforward to do, since they both use an identical steam turbine heat engine, and the cost of woodchip fuel is comparable to coal. Solid biomass is an attractive fuel for addressing the concerns of the energy crisis and climate change, since the fuel is affordable, widely available, close to carbon neutral and thus climate-neutral in terms of carbon dioxide (CO2), since in the ideal case only the carbon dioxide which was drawn in during the tree’s growth and stored in the wood is released into the atmosphere again. Compared to the solid waste disposal problems of coal and nuclear fuels, woodchip fuel's waste disposal problems are less grave; in a study from 2001 fly ash from woodchip combustion had 28.6 mg cadmium/kg dry matter. Compared to fly ash from burning of straw, cadmium was bound more heavily, with only small amounts of cadmium leached. It was speciated as a form of cadmium oxide, cadmium silicate (CdSiO3); authors noted that adding it to agricultural or forest soils in the long-term could cause a problem with accumulation of cadmium. Like coal, wood combustion is a known source of mercury emissions, particularly in northern climates during winter. The mercury is both gaseous as elemental mercury (especially when wood pellets are burned) or mercury oxide, and solid PM2.5 particulate matter when untreated wood is used. When wood burning is used for space heating, indoor emissions of 1,3-butadiene, benzene, formaldehyde and acetaldehyde, which are suspected or known carcinogenic compounds, are elevated. The cancer risk from these after exposure to wood smoke is estimated to be low in developed countries. Certain techniques for burning woodchips result in the production of biochar – effectively charcoal – which can be either utilised as charcoal, or returned to the soil, since wood ash can be used as a mineral-rich plant fertilizer. The latter method can result in an effectively carbon-negative system, as well as acting as a very effective soil conditioner, enhancing water and nutrient retention in poor soils. Unlike the smooth, uniform shape of manufactured wood pellets, woodchip sizes vary and are often mixed with twigs and sawdust. This mixture has a higher probability of jamming in small feed mechanisms. Thus, sooner or later, one or more jams is likely to occur. This reduces the reliability of the system, as well as increasing maintenance costs. Despite what some pellet stove manufacturers may say, researchers who are experienced with woodchips, say they are not compatible with the 2 inch (5 cm) auger used in pellet stoves. Wood is occasionally used to power engines, such as steam engines, Stirling engines, and Otto engines running on woodgas. As of 2008, these systems are rare, but as technology and the need for it develops, it is likely to be more common in the future. For the time being, wood can be increasingly used for heating applications. This will reduce the demand for heating oil, and thereby allow a greater percentage of fuel oil to be used for applications such as internal combustion engines, which are less compatible with wood based fuel and other solid biomass fuels. Heating applications generally do not require refined or processed fuels, which are almost always more expensive. Woodchips are similar to wood pellets, in that the movement and handling is more amenable to automation than cord wood, particularly for smaller systems. Woodchips are less expensive to produce than wood pellets, which must be processed in specialized facilities. While avoiding the costs associated with refinement, the lower density and higher moisture content of woodchips reduces their calorific value, substantially increasing the feedstock needed to generate an equivalent amount of heat. Greater physical volume requirements also increase the expense and emissions impact of trucking, storing and/or shipping the wood. Compared to conventional timber harvesting, woodchip harvesting has a greater impact on the environment, since a larger proportion of biomass is removed. Increased use of woodchips can have negative effects on the stability and long-term growth of the forests in which they're removed from. For instance, chipping of trees from forests has been shown to increase the removal of plant nutrients and organic matter from an ecosystem, thereby reducing both the nutrients and humus content of the soil. One option to balance the negative effects of woodchip harvesting is to return the woodchip ash to the forest which would restore some of the lost nutrients back into the soil. If woodchips are harvested as a by-product of sustainable forestry practices, then this is considered a source of renewable energy. On the other hand, harvesting practices, such as clearcutting large areas, are highly damaging to forest ecosystems. Theoretically, whole-tree chip harvesting does not have as high a solar energy efficiency compared to short rotation coppice; however, it can be an energy-efficient and low-cost method of harvesting. In some cases, this practice may be controversial when whole-tree harvesting may often be associated with clear cutting and perhaps other questionable forestry practices. Woodchips and bark chips can be used as bulking agents in industrial composting of municipal biodegradeable waste, particularly biosolids. Woodchip biomass does not have the waste disposal issues of coal and nuclear power, since wood ash can be used directly as a mineral-rich plant fertilizer. Woodchip harvesting can be used in concert with creating man made firebreaks, which are used as barriers to the spread of wildfire. Undergrowth coppice is ideal for chipping, and larger trees may be left in place to shade the forest floor and reduce the rate of fuel accumulation. Currently, domestic or residential sized systems are not available in products for sale on the general market. Homemade devices have been produced, that are small-scale, clean-burning, and efficient for woodchip fuels. Much of the research activity to date, has consisted of small budget projects that are self-funded. The majority of funding for energy research has been for liquid biofuels. Woodchip costs usually depend on such factors as the distance from the point of delivery, the type of material (such as bark, sawmill residue or whole-tree chips), demand by other markets and how the wood fuel is transported. Chips delivered directly to the (powerplant) station by truck are less expensive than those delivered ... and shipped by railcar. The range of prices is typically between US$18 to US$30 per (wet)-ton delivered. In 2006, prices were US$15 and US$30 per wet-ton in the northeast. In the 20 years leading up to 2008, prices have fluctuated between US$60–70/oven-dry metric ton (odmt) in the southern states, and between US$60/odmt and US$160/odmt in the Northwest. Wood chips have been used as a source of single-dwelling heating in Canada since the early days of settling but the development of oil and natural gas has dramatically decreased its usage. Most of the wood chip usage is by installations such as schools, hospitals and prisons. Prince Edward Island (PEI) has the most wood-chip plants due to high electricity rates and subsidies from the federal government. Nova Scotia has a 2.5 MW wood chip burning system that provides power to a textile factory as well as systems that provide power to a poultry processing plant, two hospitals and an agricultural college. The University of New Brunswick operates a wood chip burning furnace system to supply heat to the university, several industrial buildings, an apartment complex and a hospital. Usage of wood chips for heat is low in Quebec due to low hydroelectricity rates but a small town is using wood chips as an alternative to road salt for icy roads. EMC3 Technologies started producing wood chips coated with magnesium chloride in November 2017 for the town and has claimed it maintains traction in -30 degrees Celsius compared to regular road salt at -15 degrees Celsius. In Ontario, wood chip operations include a college in Brockville, a few secondary schools in Northern Ontario as well as a chip-fired boiler at the National Forestry Institute in Petawawa. In the late 1980’s, the Ontario provincial government in conjunction with the federal government subsidized building three co-generation plants next to sawmills. The first one was constructed in 1987 in Chapleau followed by a plant built in Cochrane in 1989 and the largest one in Kirkland Lake which was built in 1991. In several well wooded European countries (e.g. Austria, Finland, Germany, Sweden) woodchips are becoming an alternative fuel for family homes and larger buildings due to the abundant availability of woodchips, which result in low fuel costs. The European Union is promoting woodchips for energy production in the EU Forest action plan 2007–2011. The total long term potential of woodchips in the EU is estimated to be 913 million m3. After a long period of negative scores, the demand of woodchips for paper manufacturing started increasing again. Starting in the last quarter of 2013, orders for printing paper and card board increased before the consumption tax increase then by weakening yen, import of papers like copy paper decreases and export of paper increases, which stimulate paper production in Japan. Softwood chip prices from the United States increased by 12% compared to October 2013 and softwood chip prices from Australia increased by 7%. ^ a b c Janssen, Rainer; Rutz, Dominik (2011-11-03). Bioenergy for Sustainable Development in Africa. Springer Science & Business Media. ISBN 9789400721814. ^ Energy Solutions, Hotel (February 2018). "Biomass - Wood Chips and Wood Pellets - Heating Systems" (PDF). Intelligent Energy Europe: 3. ^ GB, Forestry Commission. "Wood chips". www.forestry.gov.uk. Retrieved 2018-03-04. ^ Lopez-Ponnada, E. V.; Lynn, T. J.; Peterson, M.; Ergas, S. J.; Mihelcic, J. R. (2017-05-01). "Application of denitrifying wood chip bioreactors for management of residential non-point sources of nitrogen". Journal of Biological Engineering. 11: 16. doi:10.1186/s13036-017-0057-4. PMC 5410704. PMID 28469703. ^ Royse, Daniel J.; Sanchez-Vazquez, Jose E. (2001-02-01). "Influence of substrate wood-chip particle size on shiitake (Lentinula edodes) yield". Bioresource Technology. 76 (3): 229–233. doi:10.1016/S0960-8524(00)00110-3. ISSN 0960-8524. ^ a b GB, Forestry Commission. "Wood chips". www.forestry.gov.uk. Retrieved 2018-03-04. ^ "Woodwaste" (PDF). Government of British Columbia. May 2014. Retrieved February 27, 2018. ^ "Wood Energy from Farm Forests" (PDF). Agriculture and Food Development Authority. November 2009. Retrieved February 27, 2018. ^ "the definition of woodchipper". Dictionary.com. Retrieved 2018-02-28. ^ Döring, Stefan (2012-10-19). Power from Pellets: Technology and Applications. Springer Science & Business Media. ISBN 9783642199622. ^ a b c Sixta, Herbert, ed. (2006). Handbook of pulp. 1. Winheim, Germany: Wiley-VCH. pp. 79–88. ISBN 978-3-527-30997-9. ^ a b c "Machines to produce woodchips from biomass of landscape conservation and maintenance work (LCMW) - greenGain.eu". greenGain.eu. 2015-09-23. Retrieved 2018-04-12. ^ a b "Wood Energy - Wood Harvesting Equipment". www.woodenergy.ie. Retrieved 2018-04-12. ^ "Wood Chipper & Wood Shredder Guide | Landpower UK | Landpower Machinery - Templecombe, Somerset, Dorset, Hampshire, Wiltshire & Devon". www.landpoweruk.com. Retrieved 2018-04-12. ^ Ramgopal, Y. N. (June 2016). "A Study on Production of Pulp from Ground Nut Shells" (PDF). International Journal of Scientific and Engineering Research. 7: 423–428 – via IJSER. ^ "Natural Regeneration" (PDF). Office of Environment and Heritage, Department of Premier and Cabinet NSW. October 2012. Retrieved February 28, 2018. ^ a b Marshall, Mike (March 25, 2011). "Playground Surfacing Materials ADA-Approved and Non-Appproved" (PDF). Archived (PDF) from the original on 2017-12-14. Retrieved July 25, 2017. ^ "How to Use Smoking Woods". Retrieved 12 April 2018. ^ Warneke, S; Schipper, L. A.; Bruesewitz, D. A.; Baisden, W. T. (2011). "A comparison of different approaches for measuring denitrification rates in a nitrate removing bioreactor". Water Research. 45 (14): 4141–51. doi:10.1016/j.watres.2011.05.027. PMID 21696799. ^ Carney, K. N.; Rodgers, M; Lawlor, P. G.; Zhan, X (2013). "Treatment of separated piggery anaerobic digestate liquid using woodchip biofilters". Environmental Technology. 34 (5–8): 663–70. doi:10.1080/09593330.2012.710408. PMID 23837316. ^ Ghane, E; Fausey, N. R.; Brown, L. C. (2015). "Modeling nitrate removal in a denitrification bed". Water Research. 71: 294–305. doi:10.1016/j.watres.2014.10.039. PMID 25638338. ^ a b c d e f "Wooden Chips". A&S Enterprises. 2018. Retrieved February 28, 2018. ^ Hansen, H. K.; Pedersen, A. J.; Ottosen, L. M.; Villumsen, A (2001). "Speciation and mobility of cadmium in straw and wood combustion fly ash". Chemosphere. 45 (1): 123–8. Bibcode:2001Chmsp..45..123H. doi:10.1016/s0045-6535(01)00026-1. PMID 11572586. ^ Huang, J; Hopke, P. K.; Choi, H. D.; Laing, J. R.; Cui, H; Zananski, T. J.; Chandrasekaran, S. R.; Rattigan, O. V.; Holsen, T. M. (2011). "Mercury (Hg) emissions from domestic biomass combustion for space heating". Chemosphere. 84 (11): 1694–9. Bibcode:2011Chmsp..84.1694H. doi:10.1016/j.chemosphere.2011.04.078. PMID 21620435. ^ Rilo, H. L.; Zeng, Y; Alejandro, R; Carroll, P. B.; Bereiter, D; Venkataramanan, R; Tzakis, A. G.; Starzl, T. E.; Ricordi, C (1991). "Effect of FK 506 on function of human islets of Langerhans". Transplantation Proceedings. 23 (6): 3164–5. PMC 2965621. PMID 1721393. ^ Chalker-Scott, Linda (December 2007). "Impact of Mulches on Landscape Plants and the Environment - A Review" (PDF). Journal of Environmental Horticulture. 25: 239–249 – via Oregon State. ^ "Biomass" (PDF). Vattenfall Research and Development Magazine. 4: 1–20. December 2010 – via Vattenfall Corporate. ^ a b c "Environmental Issues During the Production and Handling of Wood Fuels" (PDF). Videncenter. March 2004. Retrieved February 28, 2018. ^ "Large Scale Power Generation Using Forestry and Wood Industry By Products" (PDF). IEA Greenhouse Gas R&D Programme. November 1999. ^ Dou, Chang; Marcondes, Wilian F.; Djaja, Jessica E.; Bura, Renata; Gustafson, Rick (2017-06-05). "Can we use short rotation coppice poplar for sugar based biorefinery feedstock? Bioconversion of 2-year-old poplar grown as short rotation coppice". Biotechnology for Biofuels. 10: 144. doi:10.1186/s13068-017-0829-6. PMC 5460468. PMID 28592993. ^ Malinska, Krystyna; Zabochnick, A-Swiatek (2013). "SELECTION OF BULKING AGENTS FOR COMPOSTING OF SEWAGE SLUDGE" (PDF). Environment Protection Engineering. 39: 91–103. ^ a b c d Consulting Services, Flann (April 2018). "Woodchip Combustion in Eastern Canada" (PDF). R.E.A.P. Canada: 1–33. ^ "Quebec town swaps out salt for eco-friendly wood chips on icy roads | CBC News". CBC. Retrieved 2018-04-12. ^ "Good development for the Japanese wood chip market". ITTO. Fordaq S.A. 15 May 2014. Archived from the original on 8 August 2014. Look up woodchips in Wiktionary, the free dictionary. Wikimedia Commons has media related to Woodchips.